"Woman X" redirects here. For other uses, see X woman (disambiguation) and Madame X (disambiguation). The evolution and geographic spread of Denisovans as compared with Neanderthals, Homo heidelbergensis and Homo erectus. The Denisovans or Denisova hominins ( /dɪˈniːsəvə/ di-NEE-sə-və) are an extinct species or subspecies of archaic humans in the genus Homo. Pending its taxonomic status, it currently carries temporary species or subspecies names Homo denisova, Homo altaiensis, Homo sapiens denisova, or Homo sp. Altai. In 2010, scientists announced the discovery of an undated finger bone fragment of a juvenile female found in the Denisova Cave in the Altai Mountains in Siberia, a cave that has also been inhabited by Neanderthals and modern humans. The mitochondrial DNA (mtDNA) of the finger bone showed it to be genetically distinct from Neanderthals and modern humans. The nuclear genome from this specimen suggested that Denisovans shared a common origin with Neanderthals, that they ranged from Siberia to Southeast Asia, and that they lived among and interbred with the ancestors of some modern humans, with about 3% to 5% of the DNA of Melanesians and Aboriginal Australians and around 6% in Papuans deriving from Denisovans. Several additional specimens were subsequently discovered and characterized. A comparison with the genome of another Neanderthal from the Denisova cave revealed local interbreeding with local Neanderthal DNA representing 17% of the Denisovan genome, and evidence of interbreeding with an as yet unidentified ancient human lineage, while an unexpected degree of mtDNA divergence among Denisovans was detected. The lineage that developed into Denisovans and Neanderthals is estimated to have separated from the lineage that developed into "anatomically modern" Homo sapiens approximately 600,000 to 744,000 years ago. Denisovans and Neanderthals then significantly diverged from each other genetically a mere 300 generations after that. Several types of humans, including Denisovans, Neanderthals and related hybrids, may have each dwelt in the Denisova Cave in Siberia over thousands of years, but it is unclear whether they ever co-habitated in the cave. The Denisova Cave is in south-western Siberia, Russia in the Altai Mountains near the border with Kazakhstan, China and Mongolia. It is named after Denis, a Russian hermit who lived there in the 18th century. The cave was originally explored in the 1970s by Russian paleontologist Nikolai Ovodov, who was looking for remains of canids. In 2008, Michael Shunkov from the Russian Academy of Sciences and other Russian archaeologists from the Institute of Archaeology and Ethnology of Novosibirsk investigated the cave. They found the finger bone of a juvenile hominin, originally referred to as the "X woman" (referring to the maternal descent of mtDNA), or the Denisova hominin. Artifacts (including a bracelet) excavated in the cave at the same level were dated using radiocarbon and oxygen isotopes to around 40,000 BP. Excavations have since revealed human artifacts showing an intermittent presence going back 125,000 years. A team of scientists led by Johannes Krause and Svante Pääbo from the Max Planck Institute for Evolutionary Anthropology in Leipzig, Germany, sequenced mtDNA extracted from the fragment. The cool climate of the Denisova Cave preserved the DNA. The average annual temperature of the cave is 0 °C, which has contributed to the preservation of archaic DNA among the remains discovered. The analysis indicated that the Denisova hominin "diverged from a common ancestor well before Neanderthals and modern humans did"—around 1 million years ago. The mtDNA analysis further suggested that this new hominin species was the result of an earlier migration out of Africa, distinct from the later out-of-Africa migrations associated with modern humans, but also distinct from the even earlier African exodus of Homo erectus. Pääbo noted that the existence of this distant branch creates a much more complex picture of humankind during the Late Pleistocene. This work shows that the Denisovans were actually a sister group to the Neanderthals, branching off from the human lineage 550,000 years ago, and diverging from Neanderthals, probably in the Middle East, 300,000 years ago. 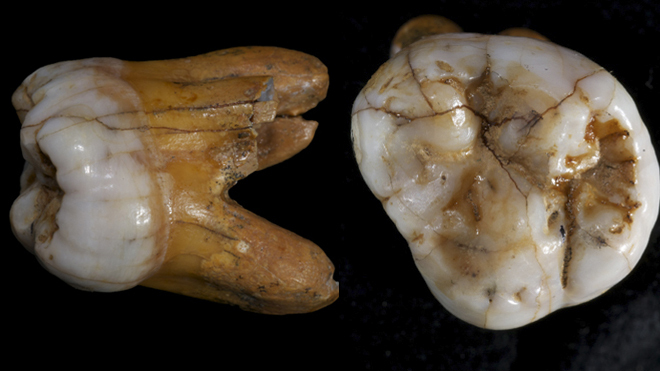 A second paper from the Svante Pääbo group reported the prior discovery of a third upper molar from a young adult, dating from about the same time (the finger was from level 11 in the cave sequence, the tooth from level 11.1). The tooth differed in several aspects from those of Neanderthals, while having archaic characteristics similar to the teeth of Homo erectus. They performed mtDNA analysis on the tooth and found it to have a sequence somewhat similar to that of the finger bone, indicating a divergence time about 7,500 years before, and suggesting that it belonged to a different individual from the same population. So far, the fossils of four distinct Denisovans from Denisova Cave have been identified through their DNA: Denisova 2, Denisova 3, Denisova 4, and Denisova 8. Analysis of a fifth specimen, Denisova 11, proved it to have belonged to an F1 Denisovan-Neanderthal hybrid. Denisova 2 and Denisova 3 are prepubescent or adolescent females, while Denisova 4 and Denisova 8 are adult males. mtDNA analysis of the Denisovan individuals suggests the Denisova 2 fossil is the oldest, followed by Denisova 8, while Denisova 3 and Denisova 4 are roughly contemporaneous. During DNA sequencing, a low proportion of the Denisova 2, Denisova 4 and Denisova 8 genomes were found to have survived, but a high proportion of the Denisova 3 genome had survived. Michael Shunkov Denisova cave (Russia) Johannes Krause, et al. Denisova 4 (molar) Homo sp. 30–50 ka 2000 Denisova cave (Russia) David Reich, et al. (arm or leg bone fragment) Homo sp. Little is known of the precise anatomical features of the Denisovans, since the only physical remains discovered thus far are the finger bone, two teeth from which genetic material has been gathered, and a toe bone. The single finger bone is unusually broad and robust, well outside the variation seen in modern people. It belonged to a female, indicating that the Denisovans were extremely robust, perhaps similar in build to the Neanderthals. The tooth does not share the derived morphological features seen in Neanderthal or modern human teeth. An initial morphological characterization of the toe bone led to the suggestion that it may have belonged to a Neanderthal-Denisovan hybrid individual, although a critic suggested that the morphology was inconclusive. This toe bone's DNA was analyzed by Pääbo. After looking at the full genome, Pääbo and others confirmed that humans produced hybrids with Denisovans. Some older findings may or may not belong to the Denisovan line. These include the skulls from Dali and Maba, and a number of more fragmentary remains from Asia. Asia is not well mapped with regard to human evolution, and the above finds may represent a group of "Asian Neanderthals". The mitochondrial DNA (mtDNA) from the finger bone discovered in Denisova Cave differs from that of modern humans by 385 bases (nucleotides) out of approximately 16,500, whereas the difference between modern humans and Neanderthals is around 202 bases. In contrast, the difference between chimpanzees and modern humans is approximately 1,462 mtDNA base pairs. This suggested a divergence time around one million years ago. The more divergent Denisovan mtDNA has been interpreted as evidence of admixture between Denisovans and an unknown archaic population. Studies suggest that a population related to modern humans contributed mtDNA to the Neanderthal lineage, but not to the Denisovan mitochondrial genomes yet sequenced. It has suggested the species could be Homo heidelbergensis, but that species is now generally considered to be too closely related to the Neanderthals. That it could have been a Homo erectus-like introgression into the Denisovans about 53,000 years ago that is responsible for the anomalously-divergent mtDNA has also been proposed. The mtDNA from a tooth bore a high similarity to that of the finger bone, indicating that they belonged to the same population. From a second tooth, an mtDNA sequence was recovered that showed an unexpectedly large number of genetic differences compared to that found in the other tooth and the finger, suggesting a high degree of mtDNA diversity. These two individuals from the same cave showed more diversity than seen among sampled Neanderthals from all of Eurasia, and were as different as modern-day humans from different continents. The isolation and sequencing of nuclear DNA from the Denisova finger bone revealed an unusual degree of DNA preservation with only low-level contamination, allowing near-complete genomic sequencing and detailed comparison with the genomes of Neanderthals and modern humans. Despite the apparent divergence of their mitochondrial sequence, the Denisova population share a common branch with Neanderthals, with a more distant split from the lineage leading to modern African humans. The Denisovan and Neanderthal sequences were estimated to have diverged about 640,000 years ago, with divergence of the branch leading to these groups from modern Africans dating to about 800,000 years ago. The authors of the study speculated that the anomalous more-divergent Denisovan mtDNA resulted either from the persistence of an ancient mtDNA lineage purged from the other branches of humanity through genetic drift or else an introgression from an older hominin lineage. The mtDNA sequence from the femur of a 400,000-year-old Homo heidelbergensis from the Sima de los Huesos cave in Spain was found to be related to those of Neanderthals and Denisovans, but closer to the latter. Analysis of nuclear DNA sequences from two specimens showed they were more closely related to Neanderthals rather than to Denisovans, yet one of these samples also had the Denisovan-related mtDNA. The studies' authors posited that the mtDNA found in these specimens represents an archaic sequence indicative of Neanderthal's kinship with Denisovans that was subsequently lost in Neanderthals due to replacement by modern-human-related sequence. An analysis of the natural degradation processes of ancient DNA, which differs between methylated and unmethylated cytosines, has provided insight into Denisovan and Neanderthal epigenetics. Because changes in cytosine methylation are correlated with gene regulation, the full DNA methylation maps allowed an assessment of gene activity throughout the Denisovan genome, as compared to that of modern humans and Neanderthals. About 200 genes were identified that show distinct regulatory patterns in Denisovans. A detailed comparison of the Denisovan, Neanderthal, and modern human genomes has revealed evidence for a complex web of interbreeding among the lineages. Through such interbreeding, 17% of the Denisova genome represents DNA from the local Neanderthal population, while evidence was also found of a contribution to the nuclear genome from an ancient hominin lineage yet to be identified, perhaps the source of the anomalously ancient mtDNA. DNA from this unidentified but highly archaic species that diverged from other populations over a million years ago represents as much as 8% of the Altai Denisovan genome. The only widespread remains of archaic humans in the Late Pleistocene Asian region are from Homo Erectus, although East Asian variants such as Dali Man have Neanderthal characteristics. The Denisovan genome shared more derived alleles with the Altai Neanderthal genome from Siberia than with the Vindija cave Neanderthal genome from Croatia and the Mezmaiskaya cave Neanderthal genome from the Caucasus, suggesting that the gene flow came from a population that was more closely related to the Altai Neanderthal. The web of archaic human intermixing is highlighted by the genome from a 90,000-year-old bone fragment from the Denisova cave, found to have belonged to a Denisovan-Neanderthal hybrid female. Her Denisovan father had the typical Altai Neanderthal introgression, while her Neanderthal mother represented a population more closely related to Vindija Neanderthals than to those of Altai. Analysis of genomes of modern humans show that they mated with at least two groups of archaic humans: Neanderthals (more similar to those found in the Caucasus than those from the Altai region) and Denisovans, and that such interbreedings occurred on multiple occasions. Approximately 1–4% of the DNA of non-African modern humans is shared with Neanderthals as a result of interbreeding. Tests comparing the Denisova hominin genome with those of six modern humans – a ǃKung from South Africa, a Nigerian, a Frenchman, a Papua New Guinean, a Bougainville Islander and a Han Chinese – showed that between 4 and 6% of the genome of Melanesians (represented by the Papua New Guinean and Bougainville Islander) derives from a Denisovan population; a later study puts the amount at 1.11% (with an additional contribution from some different and yet unknown ancestor). This DNA was possibly introduced during the early migration to Melanesia. These findings are in concordance with the results of other comparison tests which show a relative increase in allele sharing between the Denisovan and the Aboriginal Australian genome, compared to other Eurasians and African populations; however, Papuans, the population of Papua New Guinea, have more allele sharing than Aboriginal Australians. Melanesians are not the only modern-day descendants of Denisovans. David Reich of Harvard University and Mark Stoneking of the Planck Institute team found genetic evidence that Denisovan ancestry is shared also by Australian Aborigines, and smaller scattered groups of people in Southeast Asia, such as the Mamanwa, a Negrito people in the Philippines, though not all Negritos were found to possess Denisovan genes; Onge Andaman Islanders and Malaysian Jehai, for example, were found to have no significant Denisovan inheritance. This suggests that interbreeding occurred in mainland South-East Asia, and that Denisovans once ranged widely over eastern Asia. Based on the modern distribution of Denisova DNA, Denisovans may have crossed the Wallace Line, with Wallacea serving as their last refugium. Small amounts of Denisovan DNA, representing around 0.2% Denisovan ancestry, are also found in mainland Asians and Native Americans. Statistical analysis of genomic DNA sequences from different Asian populations indicates that at least two distinct populations of Denisovans existed, and that a second introgression event from Denisovans into humans occurred. A study of Han Chinese, Japanese and Dai genomes revealed that modern East Asian populations include two Denisovan DNA components: one similar to the Denisovan DNA found in Papuan genomes, and a second that is closer to the Denisovan genome from the Altai cave. These components were interpreted as representing separate introgression events involving two divergent Denisovan populations. South Asians were found to have levels of Denisovan admixture similar to that seen in East Asians, but this DNA only came from the same single Denisovan introgression seen in Papuans. Though there is no genomic evidence to support the hypothesis, the Red Deer Cave people of China have been suggested to have been the result of interbreeding between Homo sapiens and Denisovans within a few thousands years of the end of the last glacial period. The immune system's HLA alleles have drawn particular attention in the attempt to identify genes that may derive from archaic human populations. Although not present in the sequenced Denisova genome, the distribution pattern and divergence of HLA-B*73 from other HLA alleles has led to the suggestion that it introgressed from Denisovans into humans in west Asia. As of 2011, half of the HLA alleles of modern Eurasians represent archaic HLA haplotypes, and have been inferred to be of Denisovan or Neanderthal origin. The apparent over-representation of these alleles suggests a positive selective pressure for their retention in the human population. A higher-quality Denisovan genome published in 2012 reveals variants of genes in humans that are associated with dark skin, brown hair, and brown eyes – consistent with features found with Melanesians today. The Denisovan genome also contains a variant region around the EPAS1 gene that in Tibetans assists with adaptation to low oxygen levels at high altitude. In Papuans, introgressed Neanderthal alleles have highest frequency in genes expressed in the brain, whereas Denisovan alleles have highest frequency in genes expressed in bones and other tissues. ^ Douglas, Matthew M.; Douglas, Jonathan M. (1 January 2016). Exploring Human Biology in the Laboratory. Morton Publishing Company. p. 324. ISBN 9781617313905. ^ Zubova, Alisa; Chikisheva, T; V. Shunkov, M (1 January 2017). "The Morphology of Permanent Molars from the Paleolithic Layers of Denisova Cave (in English)". Archaeology, Ethnology & Anthropology of Eurasia. 45: 121–134. doi:10.17746/1563-0110.2017.45.1.121-134. ^ Gunbin, Konstantin V; Afonnikov, Dmitry A; Kolchanov, Nikolay A; Derevianko, Anatoly P; Rogaev, Eugeny I (2015). "The evolution of Homo sapiens denisova and Homo sapiens neanderthalensis miRNA targeting genes in the prenatal and postnatal brain". BMC Genomics. 16: S4. doi:10.1186/1471-2164-16-S13-S4. PMC 4686780. PMID 26693966. ^ "Homo sapiens ssp. Denisova". Taxonomy Browser. NCBI. Retrieved 28 October 2015. ^ "Taxonomy – Homo sapiens ssp. Denisova (Denisova hominin)". UniProt. Retrieved 28 October 2015. ^ Malyarchuk, B.A. (2011). "Adaptive evolution of the Homo mitochondrial genome". Molecular Biology. 45 (5): 845–50. doi:10.1134/S0026893311050104. PMID 22393781. ^ The bone is too small for radiocarbon dating and it was found in a mixed up layer which contained artifacts less than 30,000 years old and others more than 50,000 years old ( Reich, David (2018). Who We Are and How We Got Here. Oxford University Press. p. 53. ISBN 978-0-19-882125-0. ^ David Leveille (31 August 2012). "Scientists Map An Extinct Denisovan Girl's Genome". PRI's The World. Retrieved 31 August 2012. ^ Carl Zimmer (22 December 2010). "Denisovans Were Neanderthals' Cousins, DNA Analysis Reveals". NYTimes.com. Retrieved 22 December 2010. name="Callaway. ^ " Callaway, Ewen (2011). "First Aboriginal genome sequenced". Nature. doi:10.1038/news.2011.551. ^ Harmon, Katherine (30 August 2012). "Humans Interbred with Denisovans". Scientific American. Retrieved 24 August 2016. ^ Zimmer, Carl (16 November 2015). "In a Tooth, DNA From Some Very Old Cousins, the Denisovans". The New York Times. Retrieved 16 November 2015. ^ a b c d Sawyer, Susanna; Renaud, Gabriel; Viola, Bence; Hublin, Jean-Jacques; Gansauge, Marie-Theres; Shunkov, Michael V; Derevianko, Anatoly P; Prüfer, Kay; Kelso, Janet; Pääbo, Svante (2015). "Nuclear and mitochondrial DNA sequences from two Denisovan individuals". Proceedings of the National Academy of Sciences. 112 (51): 15696–700. Bibcode:2015PNAS..11215696S. doi:10.1073/pnas.1519905112. PMC 4697428. PMID 26630009. ^ a b c d e Pennisi, E (2013). "More Genomes from Denisova Cave Show Mixing of Early Human Groups". Science. 340 (6134): 799. doi:10.1126/science.340.6134.799. PMID 23687020. ^ a b Felton, Bruce R (8 August 2018). "Neanderthal Genome Study Reveals Homo sapiens Lineage Diverged 744,000 Years Ago, Huge Gap in Fossil Record Indicated". AncientNews.net. Retrieved 23 August 2018. ^ a b c d Marshall, Michael (5 April 2014). "Mystery Relations". New Scientist. 222 (2963): 34–38. ^ Zimmer, Carl (30 January 2019). "High Ceilings and a Lovely View: Denisova Cave Was Home to a Lost Branch of Humanity - The mysterious Denisovans may have occupied a cave in what is now Siberia for more than 250,000 years". The New York Times. Retrieved 31 January 2019. ^ Ovodov, ND; Crockford, SJ; Kuzmin, YV; Higham, TF; Hodgins, GW; van der Plicht, J (28 July 2011). "A 33,000-Year-Old Incipient Dog from the Altai Mountains of Siberia: Evidence of the Earliest Domestication Disrupted by the Last Glacial Maximum – First paleontological survey was conducted by N.D. Ovodov in 1975". PLoS ONE. 6 (7): e22821. Bibcode:2011PLoSO...622821O. doi:10.1371/journal.pone.0022821. PMC 3145761. PMID 21829526. ^ Liesowska, Anna (7 May 2015). "Stone bracelet is oldest ever found in the world". The Siberia Times. Retrieved 23 August 2018. ^ a b Mitchell, Alanna (30 January 2012). "DNA Turning Human Story Into a Tell-All". The New York Times. Retrieved 31 January 2012. ^ a b c d e f g h i j Reich, David; Green, Richard E; Kircher, Martin; Krause, Johannes; Patterson, Nick; Durand, Eric Y; Viola, Bence; Briggs, Adrian W; Stenzel, Udo; Johnson, Philip L. F; Maricic, Tomislav; Good, Jeffrey M; Marques-Bonet, Tomas; Alkan, Can; Fu, Qiaomei; Mallick, Swapan; Li, Heng; Meyer, Matthias; Eichler, Evan E; Stoneking, Mark; Richards, Michael; Talamo, Sahra; Shunkov, Michael V; Derevianko, Anatoli P; Hublin, Jean-Jacques; Kelso, Janet; Slatkin, Montgomery; Pääbo, Svante (2010). "Genetic history of an archaic hominin group from Denisova Cave in Siberia" (PDF). Nature. 468 (7327): 1053–60. Bibcode:2010Natur.468.1053R. doi:10.1038/nature09710. PMC 4306417. PMID 21179161. ^ a b Lao, Oscar; Bertranpetit, Jaume; Mondal, Mayukh (16 January 2019). "Approximate Bayesian computation with deep learning supports a third archaic introgression in Asia and Oceania". Nature Communications. 10 (1): 246. doi:10.1038/s41467-018-08089-7. ISSN 2041-1723. PMC 6335398. PMID 30651539. ^ a b Wei-Haas, Maya (22 August 2018). "Ancient Girl's Parents Were Two Different Human Species – Born 90,000 years ago, the child is the first direct evidence of interbreeding among Neanderthals and their cousins the Denisovans". National Geographic. Retrieved 25 August 2018. ^ Warren, Matthew (22 August 2018). "Mum's a Neanderthal, Dad's a Denisovan: First discovery of an ancient-human hybrid – Genetic analysis uncovers a direct descendant of two different groups of early humans". Nature. 560 (7719): 417–418. Bibcode:2018Natur.560..417W. doi:10.1038/d41586-018-06004-0. PMID 30135540. Retrieved 25 August 2018. ^ a b c d e Slon, Viviane; Viola, Bence; Renaud, Gabriel; Gansauge, Marie-Theres; Benazzi, Stefano; Sawyer, Susanna; Hublin, Jean-Jacques; Shunkov, Michael V; Derevianko, Anatoly P; Kelso, Janet; Prüfer, Kay; Meyer, Matthias; Pääbo, Svante (2017). "A fourth Denisovan individual". Science Advances. 3 (7): e1700186. Bibcode:2017SciA....3E0186S. doi:10.1126/sciadv.1700186. PMC 5501502. PMID 28695206. ^ Wong, K. (24 March 2010). "No bones about it: ancient DNA from Siberia hints at previously unknown human relative". Scientific American. ISSN 0036-8733. Retrieved 30 August 2015. ^ Callaway, Ewen (2010). "Fossil genome reveals ancestral link". Nature. 468 (7327): 1012. Bibcode:2010Natur.468.1012C. doi:10.1038/4681012a. PMID 21179140. ^ Brown, Samantha; Higham, Thomas; Slon, Viviane; Pääbo, Svante (29 March 2016). "Identification of a new hominin bone from Denisova Cave, Siberia using collagen fingerprinting and mitochondrial DNA analysis". Scientific Reports. 6: 23559. Bibcode:2016NatSR...623559B. doi:10.1038/srep23559. PMC 4810434. PMID 27020421. ^ Zimmer, Carl (18 December 2013). "Toe Fossil Provides Complete Neanderthal Genome". The New York Times. ^ Pääbo, Svante; Kelso, Janet; Reich, David; Slatkin, Montgomery; Viola, Bence; Derevianko, Anatoli P.; Shunkov, Michael V.; Doronichev, Vladimir B.; Golovanova, Liubov V. (2014). "The complete genome sequence of a Neanderthal from the Altai Mountains". Nature. 505 (7481): 43–49. Bibcode:2014Natur.505...43P. doi:10.1038/nature12886. ISSN 1476-4687. PMC 4031459. PMID 24352235. ^ Kuhlwilm, Martin; Gronau, Ilan; Hubisz, Melissa J.; de Filippo, Cesare; Prado-Martinez, Javier; Kircher, Martin; Fu, Qiaomei; Burbano, Hernán A.; Lalueza-Fox, Carles (25 February 2016). "Ancient gene flow from early modern humans into Eastern Neanderthals". Nature. 530 (7591): 429–433. Bibcode:2016Natur.530..429K. doi:10.1038/nature16544. ISSN 1476-4687. PMC 4933530. PMID 26886800. ^ Posth, Cosimo; Wißing, Christoph; Kitagawa, Keiko; Pagani, Luca; van Holstein, Laura; Racimo, Fernando; Wehrberger, Kurt; Conard, Nicholas J.; Kind, Claus Joachim (4 July 2017). "Deeply divergent archaic mitochondrial genome provides lower time boundary for African gene flow into Neanderthals". Nature Communications. 8: 16046. Bibcode:2017NatCo...816046P. doi:10.1038/ncomms16046. ISSN 2041-1723. PMC 5500885. PMID 28675384. ^ Bertranpetit, Jaume; Majumder, Partha P.; Li, Qibin; Laayouni, Hafid; Comas, David; Netea, Mihai G.; Pybus, Marc; Dall'Olio, Giovanni M.; Xu, Tina (2016). "Genomic analysis of Andamanese provides insights into ancient human migration into Asia and adaptation". Nature Genetics. 48 (9): 1066–1070. doi:10.1038/ng.3621. ISSN 1546-1718. PMID 27455350. ^ Callaway, Ewen (2013). "Hominin DNA baffles experts". Nature. 504 (7478): 16–17. Bibcode:2013Natur.504...16C. doi:10.1038/504016a. PMID 24305130. ^ Tattersall, Ian (2015). The Strange Case of the Rickety Cossack and other Cautionary Tales from Human Evolution. Palgrave Macmillan. p. 200. ISBN 978-1-137-27889-0. ^ a b Gokhman D, Lavi E, Prüfer K, Fraga MF, Riancho JA, Kelso J, Pääbo S, Meshorer E, Carmel L (2014). "Reconstructing the DNA methylation maps of the Neandertal and the Denisovan". Science. 344 (6183): 523–27. Bibcode:2014Sci...344..523G. doi:10.1126/science.1250368. PMID 24786081. ^ Holloway, April (30 January 2014). "New studies reveal 20 Percent of Neanderthal genome lives on in modern humans". ancient-origins.net. Retrieved 7 October 2016. ^ a b Prüfer, K.; Racimo, Fe. ; Patterson, N.; Jay, F.; Sankararaman, S.; Sawyer, S.; et al. (2013). "The complete genome sequence of a Neanderthal from the Altai Mountains". Nature. 505 (7481): 43–49. Bibcode:2014Natur.505...43P. doi:10.1038/nature12886. PMC 4031459. PMID 24352235. ^ Briggs, Helen (22 August 2018). "Cave girl was half Neanderthal, half Denisovan". BBC news. Retrieved 22 August 2018. ^ Marshall, Michael (22 August 2018). "Prehistoric girl had parents belonging to different human species". New Scientist. Retrieved 22 August 2018. ^ Warren, Matthew (2018). "Mum's a Neanderthal, Dad's a Denisovan: First discovery of an ancient-human hybrid". Nature. 560 (7719): 417–18. Bibcode:2018Natur.560..417W. doi:10.1038/d41586-018-06004-0. PMID 30135540. ^ Green RE, Krause J, Briggs AW, et al. (May 2010). "A draft sequence of the Neandertal genome" (PDF). Science. 328 (5979): 710–22. Bibcode:2010Sci...328..710G. doi:10.1126/science.1188021. PMC 5100745. PMID 20448178. ^ Zimmer, Carl (17 March 2016). "Humans Interbred With Hominins on Multiple Occasions, Study Finds". The New York Times. Retrieved 17 March 2016. ^ Tina Hesman Saey, "DNA data offer evidence of unknown extinct human relative", Science News, Oct. 21, 2016. Retrieved 26 Feb. 2017. ^ Rasmussen; et al. (October 2011). "An Aboriginal Australian genome reveals separate human dispersals into Asia". Science. 334 (6052): 94–98. Bibcode:2011Sci...334...94R. doi:10.1126/science.1211177. PMC 3991479. PMID 21940856. ^ Callaway, Ewen (2011). "First Aboriginal genome sequenced". Nature. doi:10.1038/news.2011.551. ^ Reich, David; Patterson, Nick; Kircher, Martin; Delfin, Frederick; Nandineni, Madhusudan R; Pugach, Irina; Ko, Albert Min-Shan; Ko, Ying-Chin; Jinam, Timothy A; Phipps, Maude E; Saitou, Naruya; Wollstein, Andreas; Kayser, Manfred; Pääbo, Svante; Stoneking, Mark (2011). "Denisova Admixture and the First Modern Human Dispersals into Southeast Asia and Oceania". The American Journal of Human Genetics. 89 (4): 516–28. doi:10.1016/j.ajhg.2011.09.005. PMC 3188841. PMID 21944045. ^ Cooper, A; Stringer, C. B (2013). "Did the Denisovans Cross Wallace's Line?". Science. 342 (6156): 321–23. Bibcode:2013Sci...342..321C. doi:10.1126/science.1244869. PMID 24136958. ^ Salleh, Anna (13 October 2013). "Humans dated ancient Denisovan relatives beyond the Wallace Line". Australian Broadcasting Corporation. Retrieved 23 August 2018. ^ Prüfer, Kay; Racimo, Fernando; Patterson, Nick; Jay, Flora; Sankararaman, Sriram; Sawyer, Susanna; Heinze, Anja; Renaud, Gabriel; Sudmant, Peter H; De Filippo, Cesare; Li, Heng; Mallick, Swapan; Dannemann, Michael; Fu, Qiaomei; Kircher, Martin; Kuhlwilm, Martin; Lachmann, Michael; Meyer, Matthias; Ongyerth, Matthias; Siebauer, Michael; Theunert, Christoph; Tandon, Arti; Moorjani, Priya; Pickrell, Joseph; Mullikin, James C; Vohr, Samuel H; Green, Richard E; Hellmann, Ines; Johnson, Philip L. F; et al. (2013). "The complete genome sequence of a Neanderthal from the Altai Mountains". Nature. 505 (7481): 43–49. Bibcode:2014Natur.505...43P. doi:10.1038/nature12886. PMC 4031459. PMID 24352235. ^ "Our ancestors mated with the mystery 'Denisovan' people – twice". New Scientist. 15 March 2018. Retrieved 20 March 2018. ^ "New Sequence Analysis Suggests There Were Two Denisovan-Modern Human Admixture Events". genomeweb.com. 1 March 2018. Retrieved 23 August 2018. ^ Browning, Sharon R.; Browning, Brian L.; Zhou, Ying; Tucci, Serena; Akey, Joshua M. (2018). "Analysis of Human Sequence Data Reveals Two Pulses of Archaic Denisovan Admixture". Cell. 173 (1): 53–61.e9. doi:10.1016/j.cell.2018.02.031. ISSN 0092-8674. PMC 5866234. PMID 29551270. ^ Barras, Colin. "Chinese fossils unlike any known species". New Scientist (Reed Business Information). Retrieved 19 December 2013. ^ Abi-Rached, L; Jobin, M. J; Kulkarni, S; McWhinnie, A; Dalva, K; Gragert, L; Babrzadeh, F; Gharizadeh, B; Luo, M; Plummer, F. A; Kimani, J; Carrington, M; Middleton, D; Rajalingam, R; Beksac, M; Marsh, S. G. E; Maiers, M; Guethlein, L. A; Tavoularis, S; Little, A.-M; Green, R. E; Norman, P. J; Parham, P (2011). "The Shaping of Modern Human Immune Systems by Multiregional Admixture with Archaic Humans". Science. 334 (6052): 89–94. Bibcode:2011Sci...334...89A. doi:10.1126/science.1209202. PMC 3677943. PMID 21868630. Lay summary – BBC News (26 August 2011). ^ Huerta-Sánchez, Emilia; Jin, Xin; Asan; Bianba, Zhuoma; Peter, Benjamin M; Vinckenbosch, Nicolas; Liang, Yu; Yi, Xin; He, Mingze; Somel, Mehmet; Ni, Peixiang; Wang, Bo; Ou, Xiaohua; Huasang; Luosang, Jiangbai; Cuo, Zha Xi Ping; Li, Kui; Gao, Guoyi; Yin, Ye; Wang, Wei; Zhang, Xiuqing; Xu, Xun; Yang, Huanming; Li, Yingrui; Wang, Jian; Wang, Jun; Nielsen, Rasmus (2014). "Altitude adaptation in Tibetans caused by introgression of Denisovan-like DNA". Nature. 512 (7513): 194–97. Bibcode:2014Natur.512..194H. doi:10.1038/nature13408. PMC 4134395. PMID 25043035. ^ Brahic, Catherine (5 July 2014). "Extinct humans primed Tibetans for the high life". New Scientist. ^ Akkuratov, Evgeny E; Gelfand, Mikhail S; Khrameeva, Ekaterina E (2018). "Neanderthal and Denisovan ancestry in Papuans: A functional study". Journal of Bioinformatics and Computational Biology. 16 (2): 1840011. doi:10.1142/S0219720018400115. PMID 29739306. Barras, Colin (13 August 2011). "Stone Age toe could redraw human family tree". New Scientist. Fox, Maggie (24 March 2010). "Possible new human ancestor found in Siberia". Reuters. Ghosh, Pallab (22 December 2010). "Ancient humans, dubbed 'Denisovans', interbred with us". BBC News online. The study shows that Denisovans interbred with the ancestors of the modern people of the Melanesian region north and north-east of Australia. Melanesian DNA comprises between 4% and 6% Denisovan DNA. Greshko, Michael (15 November 2015). "DNA Reveals Mysterious Human Cousin With Huge Teeth". National Geographic. Hawks, John (22 December 2010). "The Denisova genome FAQ". John Hawks Weblog. Rincon, Paul (25 March 2010). "DNA identifies new ancient human dubbed 'X-woman'". BBC News online. Shreeve, Jamie (July 2013). "The Case of the Missing Ancestor". National Geographic. Wade, Nicholas (24 March 2010). "Bone May Reveal a New Human Group". The New York Times. Wenz, John (27 August 2014). "The Other Neanderthal". The Atlantic. Zimmer, Carl (24 March 2010). "Hybrid speculation (blog)". Discover. Zimmer, Carl (22 December 2010). "Meet the Denisovans, the newest members of the human tree of life (blog)". Discover.